Phuket leading golf vacation organisers. 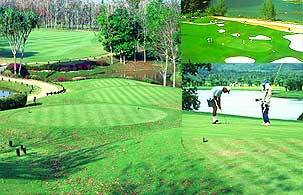 Golf courses in Phuket. Details of every course from Golf in Phuket Managed by Golfers - for Golfers The championship courses at the Blue Canyon Country Club are one of the golfing worlds best kept secrets Start Here now. Generally considered to be the most popular golfing destination in Thailand , Phuket has something to offer golfers of all abilities. It’s also a great destination for the non-golfers in your party with so much to see and do.